Learn about how the advanced tax settings and tax shortcut codes work in Kashoo. If you are looking to quickly and simply set up taxes, please view this Setting Up Taxes article. 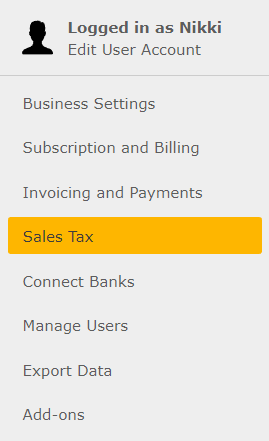 Go to the Settings Area and select the Sales Tax page. To add a new tax, click on Create New Tax. To edit a tax, click on Edit. Name: This is the name of the tax, such as: State Tax. This is the name that will be displayed on your invoices. Abbreviation: This is a one letter code that you use when entering income or expense transactions. Taking the name examples above, it could be S for State Tax. Rate: This is the standard rate for the tax. If you have multiple tax rates for a single tax, such as 5%, 8%, and 10%, we will discuss how to set this up later in the "Having multiple rates for a single tax" part of this article. Description: This field is for adding any details about the tax that you would find helpful. It does not appear on your invoices. Receivable Account: This account is only used if the Registered checkbox is selected. This is the account used for tracking taxes paid on expenses, that you can receive back from the government (if you are in a tax jurisdiction that allows this). If you do not choose an account, the first time you use the tax when entering an expense, an account called "(name of tax) Receivable" will be created in your chart of accounts. So, if your tax name was State Tax, it would create an account called "State Tax Receivable". Note: You will have to log out and back in to see the account show up in your chart of accounts. Payable Account: This account is only used if the Registered checkbox is selected. This is the account used for tracking taxes collected on sales that are owed to the tax authorities. As with the other tax accounts, if you do not select a payable account, one will be automatically created for you when you enter income using the tax for the first time. Note: You will have to log out and back in to see the account show up in your chart of accounts. Expense Account: This account is used if taxes accumulated in your tax receivable account cannot be received back from the government. The expense account is used when taxes paid on certain expenses, like "Meals and Entertainment" cannot be fully received back. Registered: If you do not check this box then you will not be able to access the tax in the Sales tax field when you do an income transaction. You can, however, access any of the taxes in the Sales tax field on an expense transaction but they will not accumulate in the tax receivable accounts. 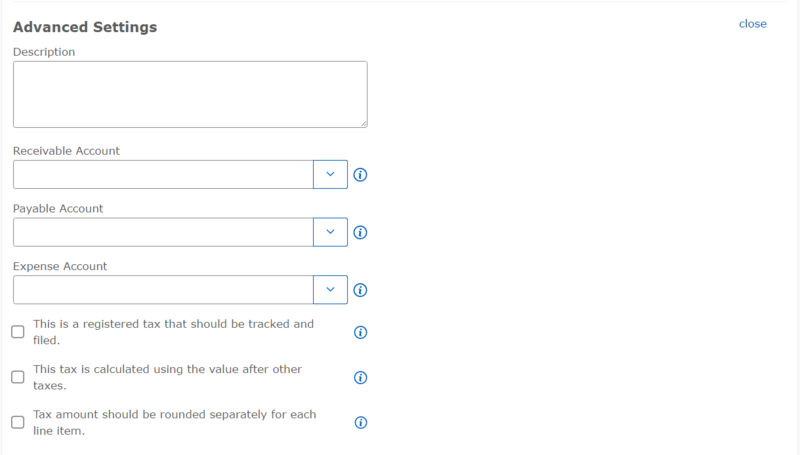 You need to check this box on the individual tax configurations to be able to accumulate the tax that you collect. Once you do that, if you select a tax on the expense side it will accumulate in the tax receivable account even if you do not have one set up. So if you do not want the tax to accumulate in tax receivable you have to enter the amount including the tax in the price field. Registration #: This is your tax registration number. In some tax jurisdictions it is a requirement by law to display this number. In order to have the tax registration number show up on your invoice, you must enter the number here. Cumulative: The default for this is unchecked. If you need to charge this tax on top of the value of other taxes, then select this box. For example, say you have a $100 invoice and two tax codes, A at 5% and B at 10%. If you select cumulative for tax B, then the tax would be calculated on top of $105 ($100 + $5 (5% A tax)), instead of on top of $100. Rounding: The default for this is at the Invoice level. Effective Date: You use this if your tax jurisdiction has changed the standard tax rate from one value to another, such as changing from 8% to 9% on March 1st, 2013. You would enter in March 1st, 2013 as the effective date of the tax change. Previous Name: If the name of the tax has changed as of the effective date, enter the old name here. Previous Abbreviation: If you have changed the tax abbreviation as of the effective date, enter the old abbreviation here. Previous Rate: Enter in the old tax rate before the effective date. So, in our example, this would be 8%. To view, edit, and add tax shortcut codes, use the Tax Shortcut Codes section. Representing: Enter in the two tax names or abbreviations, separated by a comma. For example, if you are combining a "State Tax (S)" and "LocalTax (L)", we would write State Tax, Local Tax (or alternatively: S,L). Income: We select this checkbox because we want to use it on income transactions as well as expense transactions. If you do not select the box, the tax will only appear when you are entering expense transactions. Save: Add the new tax shortcut code by clicking on the Save button. This creates a tax shortcut code called B that you can now use to apply both the "State Tax" and "Local Tax" at the same time. If you have several rates for a single tax, instead of setting up multiple taxes with the same name, you should set up multiple tax codes which specify the rate. For example, you could create two tax shortcut codes with different rates for a tax called "State Tax", one at 5% and one at 10%. Shortcut: Make a new shortcut code, such as SThree for the 3% State Tax rate. Income: Select this checkbox to use the tax on income as well as expense transactions. Shortcut: Make a new shortcut code, such as STenfor the 10% State Tax rate. Now you have created two non-standard State Tax rates, one at 3% called SThree and one at 10% called STen. Here is the ultimate level of complexity. Say you need to combine two taxes, but you need to use rates that are different than the standard rates. Here is an example of creating a "State Tax (S)" of 10% and a "LocalTax (L)" of 5%. Income: We select this checkbox because we want to use it on income transactions as well as expense transactions.